The lifecycle of any business model starts up, scales up, and at some point, screws up. This dynamic collection of examples, principles, and practices addresses head-on the challenges that entrepreneurs and intrapreneurs face. With interviews from an international group of successful startups and scaleups, this book contains invaluable advice for creating, sustaining, and letting go of a business. The author and interviewees explore a wide range of topics that are vital for anyone dreaming of starting a new product or service and for entrepreneurs and intrapreneurs in the scale-up through scale-down phase. The book reveals how business leaders craft their product vision. A winning vision describes the essence of an innovative product and clearly shows what it aims to achieve for its users and customers. Once your vision is in place, the book helps choose from various funding options, define the qualities to look for in your first hires, how to get your product to market, and much more. 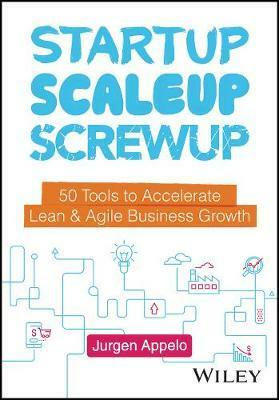 The book's tools and tips are designed to accelerate lean and agile business growth. They cover a diverse and important set of topics, such as: working with a remote team, optimizing workflows, and discovering how to use a North Star Metric and a Journey Map. Ultimately, the author prepares the reader for the date when it all comes crashing down...because one day it will. JURGEN APPELO is an author, speaker, and trainer with 400 trainees globally who license his workshops on making management fun, to help creative organizations survive and thrive in the 21st century. Jurgen is CEO of the startup Agility Scales, and co-owner of the scaleup Happy Melly. He is the author of Managing for Happiness: Games, Tools, and Practices to Motivate Any Team from Wiley.